You may or may not have had ‘the dress’ waltz onto your phone or computer screen last week, asking if you saw a black and blue dress, or gold and white one. It was a silly question that seemed to divide the internet world for 24 hours (Note: It was without doubt black and blue). Another awareness campaign against domestic violence that has gone live this week, to time with International Women’s Day, is one in London. 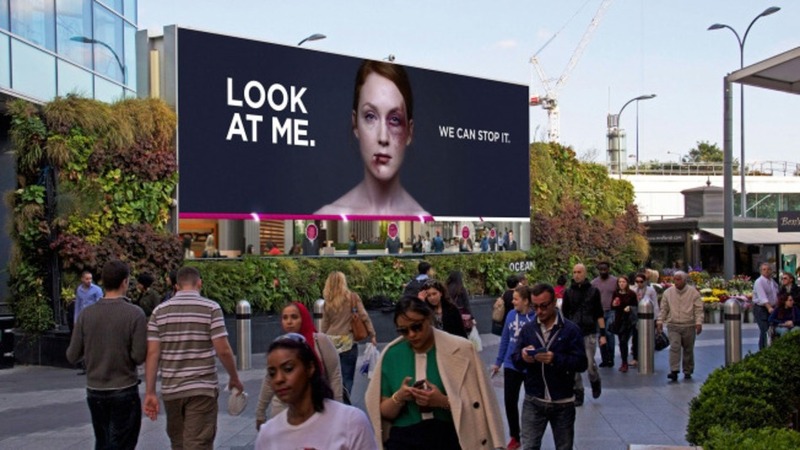 A billboard, featuring a picture of an injured woman who heals as people stop and pay attention to her, uses facial recognition technology to register when people are looking to the advert, updating a viewer count at the bottom of the board and gradually altering the image. The billboard is a collaboration between London ad agency WCRS, charity Women’s Aid and photographer Rankin. Both a very clever campaigns to keep the issue of domestic violence talked about, something that is literally usually kept behind closed doors.